To illustrate some of the points I’ll be trying to make, I’ll use this copy I made recently of a detail of a painting by Sir William Russell Flint called ‘The Secret Retreat’. For the beginner, trying to assess the failings of his latest painting can be difficult and confusing. While it’s usually obvious when something is wrong, it’s often difficult to pin it down to a specific reason. Sometimes, however, the failure isn’t in the painting technique but in the drawing. Drawing is a weakness of the majority of amateur artists and most take up painting with few if any drawing skills. Copying can help with drawing in two ways. First, it provides a means of assessing your drawing skills. Did you manage to copy the drawn elements – the figures, the architecture, etc. – accurately? Or did you struggle with proportion and perspective? And secondly, copying can give insights into the art of drawing itself. Only by careful copying and the attention it demands do you become aware of how to suggest form (volume) by variations in line; how to suggest recession and foreshortening; how to communicate balance and movement in the figure; how to represent the complex simply – capturing a figure pose or elaborate architecture with the utmost economy; and how to use ‘lost-and-found’ edges to blend or integrate forms. ‘The Secret Retreat’ is a good test of drawing skills. The variations in the treatment of line in the figure are an excellent demonstration of how they contribute to the illusion of depth and volume. Russell Flint was a fine draughtsman and his figure drawing often demonstrates great economy and elegance of line. It takes a vast amount of experience to imbue a figure drawing with personal style. Copying can also improve your facility at colour mixing. Sensitivity to colour is something that for most of us doesn’t come easily. Look at any amateur painting exhibition and it’s likely that few (if any) of the paintings will display any degree of colour artistry. Being able to identify a colour in the subject and then mix it on the palette can often be difficult even for an experienced painter. Flesh tones, for example, can be challenging to read and mix. So too is the range of greens (and blues) found in nature. Trying to copy colour faithfully will eventually reveal both the possibilities and the limitations of your chosen palette. 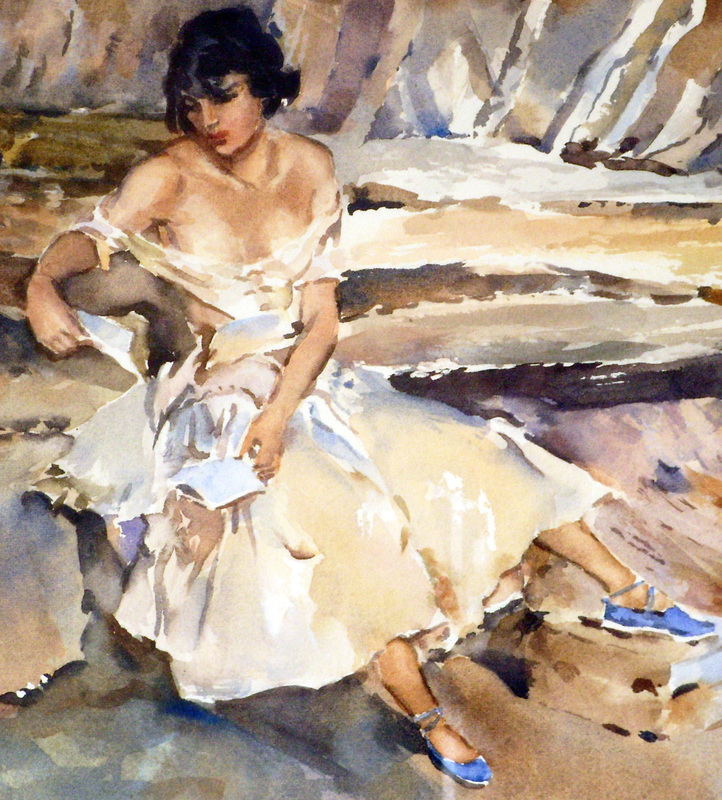 In the Russell Flint copy – which was made from a medium resolution Web image – the colours in general are crude in comparison to the source. Copying Flint makes you aware of the subtlety and delicacy of his light value washes. The dress, for example, registers as white although it is actually painted in yellowy-greys with quite strong yellow-brown and blue accents. I couldn’t match many of the transparent warm and cool greys of the underpainting. And the flesh tints in the original appear much more ‘colourful’ and vibrant than in the copy. Copying is also an excellent way of learning to assess and mix correct values or tones. Judging values is not easy. Very few beginners will start a painting with any kind of tonal plan or design in mind. They often have difficulty mixing a strong, clean, dark value and try to build up their darks with a succession of thin washes. When I first attempted to copy a Russell Flint painting, I was surprised to find just how much of the power of his work – especially his figures – is down to his handling of values. The local public art gallery has a fine Flint painting in its collection: ‘The Great Lavoir, Antibes’. They occasionally exhibit this painting alongside other watercolours from the 19th and early 20th century. The Flint stands out for a number of reasons but particularly for the force of its tonal and colour design. It’s worth studying the value range in this detail from my copy. Flint’s figures (painted in the studio, not on site) are nearly always lit from the front which has the effect of emphasising form. The girl’s right shoulder illustrates this very well: the top edge of the shoulder as it curves away from the viewer receives and reflects relatively little light and appears dark, while the part facing the viewer receives most light and is painted as a very light (but not white) value. Only by attempting to copy a subject like this do you realise the richness and intensity of the value contrasts in the work of a master. The fourth benefit of copying is seeing how different artists handle the watercolour medium: how they apply paint to paper, how they go about constructing a painting. When I first attempted to paint in the style of Russell Flint, I had nothing to work from directly. I would look at examples of his work in galleries and try to absorb some understanding of his painting process. Then I’d go away and put these insights into practice. But the results were always disappointing. Memory is no substitute for copying. When I finally acquired one or two open edition prints and set about copying them, I quickly realised how I’d underestimated almost every aspect of Flint’s handling of paint. His colour was much more saturated – especially in the shadow areas where he would often allow touches of pure primaries to run into the edges of washes. He achieved many of his effects by washing out and in some cases by using opaque white to recover or enhance the whiteness of the paper. His use of dragged (not dry brush) strokes over rough paper suggested the textures of rough stonework. He painted accents (darkest values) as rich, opaque, unblended strokes which contrasted beautifully with the surrounding transparent, colourful washes. Above all, I discovered that blending and softening every wash or stroke – a habit of the amateur – isn’t necessary; simply judging the right value is enough to allow a paint application to sit ‘right’ in the painting. I’ve described some of the benefits of copying, but what about the drawbacks? Copying can become a habit. It may give rise to a reluctance to engage in the creative aspects of the painting process. Copying provides the copier with a ready-made composition. He doesn’t have to find and arrange his subject matter; he doesn’t have to think about colour harmony, tonal organisation or focal points; he does not have to labour over the resolution of his drawing, getting the anatomy of his figures and the perspective of his architecture correct; he doesn’t have to decide what to put in and what to leave out. He simply has to copy what is in front of him. Nevertheless, if you’re looking for a way to accelerate your progress as a painter, then copying the work of some of your favourite artists is a good way to start. And as long as it does not become a crutch or a substitute for the challenge of creative work, it should prove to be a valuable resource for the amateur painter. So, do you think Russell Flint drew some outlines in a light pencil, which seems to be invisible? Also I cant see how he could do these nudes without lifting off with a pointed piece of blotter, or perhaps just a fine brush. Is his technique a bit of a secret? It seems to me to be so. Has anyone written down how he worked? Hi, Cameron. The only detailed, first-hand description of Russell Flint’s figure painting technique that I know of is by Percy Bradshaw. This account which includes step-by-step colour illustrations was reprinted in Ralph Lewis and Keith S. Gardner’s book ‘Sir William Russell Flint’ published in 1988 (ISBN 0-7153-9306-5). Copies are readily available on ebay along with later paperback reprints. According to Bradshaw, Flint began with a minimal, light charcoal drawing which he would dust off to leave faint traces. I haven’t tried this technique but I guess he used charcoal in preference to pencil because most or all traces of the charcoal would be removed by subsequent watercolour washes. The article also describes how he modelled the figure by repeated applications of thin washes and lifting out. Somehow he managed to keep the paint looking fresh despite all the re-working. I’m pretty sure a lot of Flint’s technique depended on the paper he used; I doubt if any of the papers generally available today would stand the treatment he gave his! Saunders Waterford and Bockingford are both good for lifting out and limited re-working but if you overdo things the absorbency increases and the colour goes flat. Hi David, Can you possibly help my query. Apologies, Lisa, for the long delay in replying. 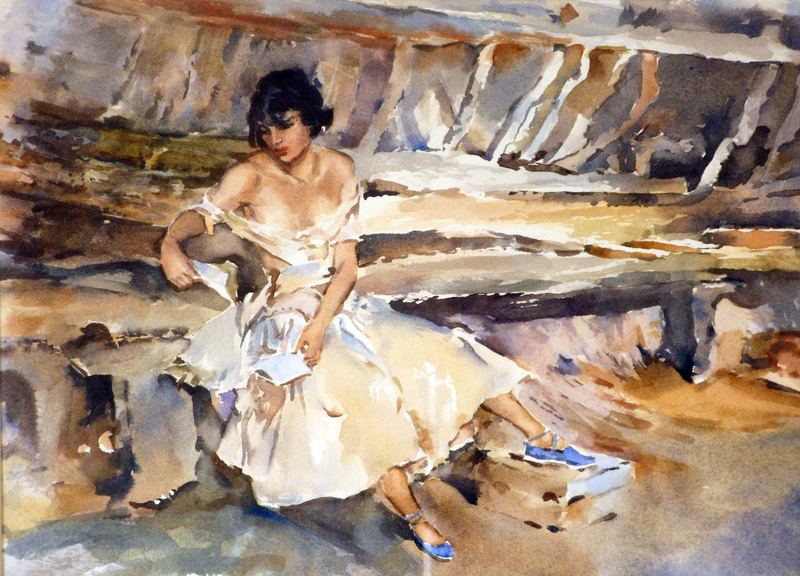 I did some searching through books and online but I can’t find any clue to the manufacturer of Russell Flint paper. I did find references to various papers that WRF used including Arnold and Whatman but nothing about a paper that bore his name.